Habersham County, GA — In May of last year, Bounkham “Baby Bou Bou” Phonesavanh, 19-months-old, was asleep in his crib. At 3:00 am militarized police barged into his family’s home because the sheriff’s department claimed that an informant had purchased $50 worth of meth from someone who once lived there. During the raid, a flash-bang grenade was thrown into the sleeping baby’s crib, exploding in his face. Baby Bou sustained severe injuries and may have possible brain damage. Prior to obtaining the warrant, Nikki Autry, a Habersham County sheriff’s deputy and a special agent with the Mountain Judicial Circuit Narcotics Criminal Investigation and Suppression Team, claimed a confidential informant “was able to purchase a quantity of methamphetamine from Wanis Thonetheva at Thonetheva’s residence,” which she identified as the house where the Phonesavanhs were staying. However, it has come to light that these were lies. The informant never purchased meth at the residence, and there were never armed guards out front. In a press release on Wednesday, the US Attorney’s Office stated that Autry has been indicted for her insidious role in the horrifying raid. According to the report, Autry has been indicted by a federal grand jury on charges of providing false information in a search warrant affidavit and providing the same false information to obtain an arrest warrant. Providing false evidence to a judge to obtain a warrant is a federal civil rights violation. “Our criminal justice system depends upon our police officers’ sworn duty to present facts truthfully and accurately—there is no arrest that is worth selling out the integrity of our law enforcement officers,” said Acting U.S. Attorney John Horn. “In this case, Autry is charged with making false statements to a judge in order to obtain search and arrest warrants. Without her false statements, there was no probable cause to search the premises for drugs or to make the arrest. And in this case, the consequences of the unlawful search were tragic,” Horn continued. The federal indictment alleges that Autry knew the NCIS informant had not purchased any methamphetamine from anyone at the residence and the NCIS informant had not proven himself to be reliable in the past. Additionally, the indictment alleges that Autry had not confirmed that there was heavy traffic in and out of the residence. Based on this false information, the magistrate judge issued a “no-knock” search warrant for the residence and an arrest warrant for W. T., who allegedly sold the methamphetamine. The warrant obtained by Autry was executed approximately two hours later, during the early morning hours of May 28, 2014. What made this woman lie about drugs being at this residence is unknown. What kind of vile person would make up fake information to send officers barging into a family’s home in the middle of the night? Despite the fact that Habersham county jurors in the local case found the warrant to have been obtained in a “hurried and sloppy” manner, lawyers for the sheriff and the other officers denied that “false and misleading information was used in the search warrant application.” This is also in spite of the fact that no drugs were found during the raid. No one was charged by the local grand jury, but, fortunately, federal prosecutors launched their own investigation in October. It is bad enough that a baby had his face blown apart by cops attempting to stop someone from selling an arbitrary substance to willing customers. 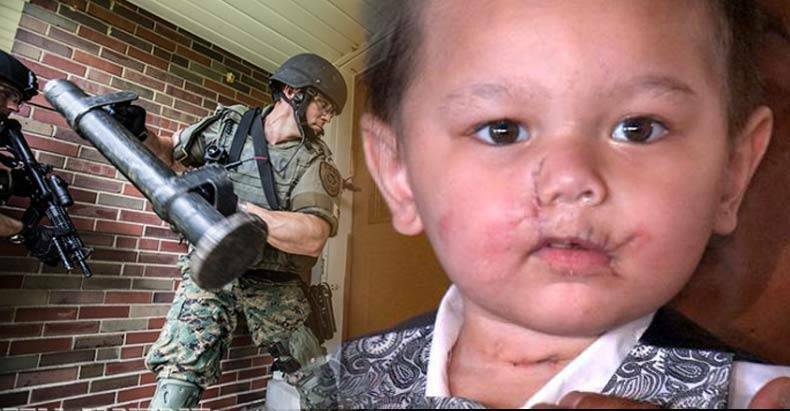 However, seeing that a federal grand jury indicted one of the deputies for falsely obtaining the warrant in the first place, makes the raid nothing more than an armed home invasion, in which thugs in militarized attire terrorized a family and attacked a baby.